Royal Navy divers destroy wartime bomb near major North Sea gas pipeline. A Royal Navy minehunter has destroyed a 500lb wartime bomb which was dredged up and then dropped - next to a major North Sea gas pipeline. HMS Cattistock and a team of expert Royal Navy divers raced to the location about 50 miles off the coast of Norfolk after a Dutch trawlerman hauled the air-dropped Second World War device onto the deck of his vessel caught in fishing nets. The trawlerman gently lowered the device back down to the sea bed before reporting his discovery to authorities but the bomb landed dangerously close to a major North Sea gas pipe. On arrival, the Royal Navy divers lifted the device from the sea bed, towed it for one mile, and then detonated it with an explosive charge. Fortunately due to its age, the bomb was discovered to be inert and no longer a threat. Petty Officer (Diver) Lee O'Sullivan, from the Royal Navy's Portsmouth-based Southern Diving Unit 2, said: "The proximity of the bomb to the gas pipeline clearly presented a significant risk but we were able to deal with the situation quickly. "We safely removed the bomb from the pipeline area, and then carried out a controlled demolition. Fortunately the bomb turned out to be inert, meaning it wouldn't have posed a danger but there was no way of knowing this until we destroyed it." Portsmouth-based HMS Cattistock arrived on scene within 24 hours of the call and swiftly located the bomb using the ship's remotely operated vehicle. The embarked bomb disposal divers went down to assess the device on Wednesday and confirmed it was an air-dropped 500lb bomb, likely to have been dropped by Germans in the Second World War. It was lying 60m from the pipeline. Constrained by the tide, the bomb disposal team attached a lifting device to the bomb on Thursday afternoon to safely remove it from the sea bed and tow it a safe area one mile away from the pipe. After lowering the device and removing the lifting cradle, a final dive was conducted to place an explosive charge on the bomb. After detonating the charge and destroying the bomb, it was found to be chemically inactive. 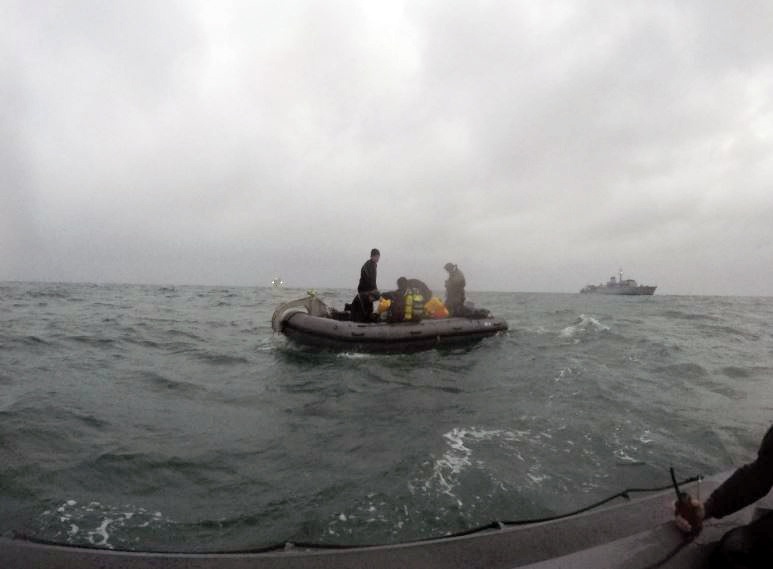 Lieutenant Commander Charles Wheen, the Commanding Officer of HMS Cattistock, said: "This is exactly the sort of task HMS Cattistock and the Royal Navy's expert divers are trained to do and we worked together to deliver a safe outcome. I'm very proud of the team involved and how they managed to resolve this potentially dangerous situation. "It's a great example of the importance of good teamwork, but I hope it also serves as a reassuring demonstration of how the Royal Navy stands by around the clock to secure the seas around Britain." HMS Cattistock, one of the Royal Navy's Hunt-class minehunters, has been in service since 1982. She has a glass-reinforced plastic hull which makes her less noticeable to lurking dangers in minefields. Southern Diving Unit 2, based in Portsmouth, is part of the Royal Navy's Fleet Diving Squadron and is responsible for explosive ordnance disposal at sea around the British Isles. As specialists in maritime bomb disposal, they also hold small teams at high readiness to deploy to the reaches of the globe to support the Royal Navy's worldwide operations.